HONG KONG -- The Chinese government for the first time has said publicly that it will cap carbon dioxide emissions from two major polluting industries, but its impact on the nation's overall climate change mitigation remains unclear. The announcement was made in a guideline published Tuesday by China's National Development and Reform Commission (NDRC), the country's top economy planner. The State Council, China's Cabinet, approved the guideline in September, but its full content was made public only earlier this week. Known as the 2014-20 National Plan to Cope With Climate Change, the guideline states multiple goals on China's greenhouse gas emissions reduction. Among them, the guideline notes, carbon emissions from Chinese steel and cement producers at the end of the decade should stay at the same level as they are in 2015. "This is the first time China mentioned something like this, and it is particularly difficult to achieve since cement and steel industries not only emit carbon dioxide through their use of energy, but also through their production process," said Yang Fuqiang, the senior adviser on climate and energy at the Beijing office of the Natural Resources Defense Council. If this did happen, it would help China halt its rapid growth on carbon emissions, Yang said. As he explained, Chinese steel and cement producers currently make up about one-fifth of the country's total carbon emissions. If the amounts of carbon dioxide emitted by the two industries are stabilized, along with other efforts China has been taking to control coal consumption, the country will likely reach its carbon emissions peak before previous projection of 2030, Yang said. Preliminary to a total carbon cap? But some experts are less excited about the release of the goal. Sun Qingwei, China climate coordinator at San Francisco-based Pacific Environment, for one, raised doubts over the effectiveness of the guideline. "Many climate policies introduced by the National Development and Reform Commission did not turn into actions, due to the lack of coordination among different government departments," Sun said. 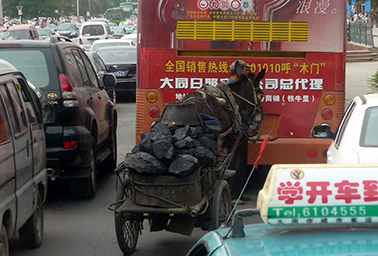 Coal may be outmoded in the future, but right now, it must keep up with the traffic in Datong, China. Photo by Gustavo Madico, courtesy of Flickr. "It's along NDRC's interest to announce an ambitious target, as it is in charge of China's climate policy, but officials from other government departments may have a different opinion," Sun said. "So far, I haven't seen any measures from Chinese energy officials to support that plan." In the statement released this week on the official website of the NDRC, Chinese policymakers did not detail how they will realize the plan. They did not say what would happen if steel and cement sectors fail to do so, either. "This target is likely to be nonbinding," said Li Shuo, climate and energy campaigner at Greenpeace China, who watches the issue closely. Li added, however, that the potential use of the carbon cap on Chinese steel and cement industries still sends out a positive signal in terms of climate change mitigation. "The target would not be released without intensive research," Li explained. This indicates that the Chinese government may look into capping carbon emissions from major polluters before it sets a cap for the total emissions of the country, Li said. China is the world's largest greenhouse gas emitter, but its traditional position in global mitigation negotiations is that it will not accept an overall emissions limit because it is still a developing nation and needs space for more economic development. Instead, China has pledged to reduce its carbon emission intensity, namely emissions per unit of economic output, by 40 to 45 percent by 2020 from the 2005 level. In a press conference hosted in September, Xie Zhenhua, deputy director of the NDRC and China's top official on climate change, told reporters that the country has already made substantial progress to achieve that goal. By the end of 2013, China had reduced carbon dioxide emissions per unit of economic output by 28.56 percent from 2005, which was equivalent to saving the world 2.5 billion tons of carbon dioxide emissions, Xie said. In the first nine months of this year, China's energy consumption per unit of economic output dropped by 4.2 percent and carbon intensity was cut by about 5 percent, both representing the largest drops in years, according to the official.